When it comes to bands that emerged from the 80’s hairband scene, few bands are more understated or overlooked than Winger, a band that despite their immense musical talent and infectious, cleverly crafted songs, somehow became the most hated band by devout metalheads thanks to a ridiculous segment on the Beavis & Butthead show. 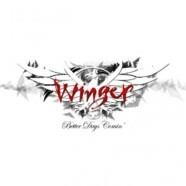 After nearly three decades and five records, Winger have just released their sixth studio album via Frontiers Records, entitled Better Days Comin’ to immense critical acclaim and with good reason as it is without a doubt the best thing they have done since their illustrious heyday and the album fans have been waiting for now for quite some time. The new album was produced by Kip Winger himself, who handled most aspects of the album on his own, other than turning to Kix’s Donnie Purnell for lyrics on a select few songs. The album begins with the sound of a car starting and a song playing on the radio in the background, kinda like KISS did at the beginning of “Detroit Rock City.” It gives way to the brutally chunky riffs and massive bottom end of “Midnight Driver Of A Love Machine” and picks up where IV and Karma left off, featuring an off the hook solo by guitar wizard Reb Beach. It’s easy to see why it was chosen to not only to start the album but picked as lead single and video. “Queen Of Babylon” is next and it is a hook laden monster similar to “Ez Come, Ez Go” that takes you on one hell of a melodic ride. Its huge anthemic choruses just begging for radio airplay. It’s followed by “Rat Race,” a song that bursts out of the gate like a Formula One race car and serves up a giant middle finger to Mike Judge. It should cement their place as a legitimate hard rock band. Title track “Better Days Comin’” is a funkadelic groove that showcases a chorus with an Earth Wind & Fire vibe to it. It goes to show that there is nothing this talented group of musicians can’t do and do well while “Tin Soldier” has a poly time signature that allows the band, especially drummer Rod Morgenstein, to flex their musical muscles. If it had been sung by James LeBrie it would have fooled even the most devout Dream Theater fan into believing it was one of their own. The keyboards and piano on tracks like “Ever Wonder” and “Be Who You Are Now” create lush soundscapes with the organic feel of 80’s techno so close your eyes and get swept away by the hypnotic melodies. There are even subtle nuances of Type O Negative’s “Love You To Death” on the latter of the two. “So Long China” is aptly titled as it has elements of 80’s era Asia and is hands down the best thing they have written since the glory days of such monster hits like “Seventeen,” “Madelaine” and “Headed For A Heartbreak” while “Storm In Me” sounds like a lost track or B Side from the Pull sessions. Closer “Out Of This World” is everything Winger ever was and never would expect to be, warped into a seven minute enigma that transcends several musical genres. It’s epic stature echoing that of Led Zeppelin’s “Kashmir.” It is a dark horse that comes out of nowhere and leaves you begging for more. Here’s the bottom line- Better Days Comin’ is a solid 9 out of 10 and not much else needs to be said. It’s a whole new chapter in Winger’s arsenal of tricks.